Look out for ice cream sandwiches as a trend this Summer, whether it’s chewy cookies, bao, brioche buns sandwiching your favourite ice cream, they’re a delicious treat that everyone will love. Here are a couple of options and recipes if you’re feeling creative in the kitchen. 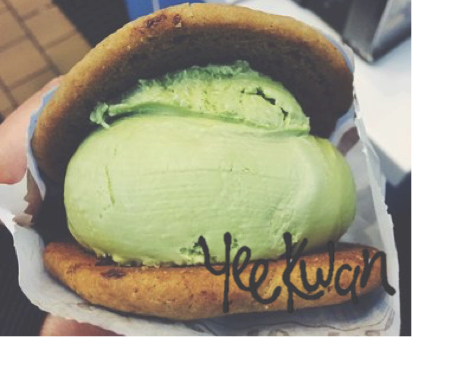 Deliciously soft and chewy white chocolate cookie sandwich with our best selling matcha green tea ice cream. 3. Add the granulated sugar followed by the brown sugar. 4. Add the flour gradually. 5. Add vanilla, salt and baking soda. 6. Add the white chocolate chips gradually while stirring. 7. Bake in the oven for 12-13 minutes. 8. They will be very soft when removed from the oven, but immediately use a metal spatula to remove them from the cookie sheets and let the cookies cool on a metal wire rack.